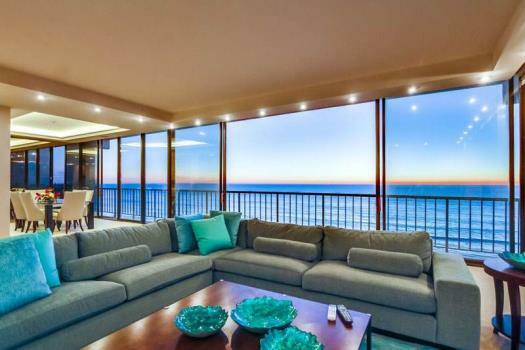 This gorgeous ocean front property in North Mission Beach will have you never wanting to leave. The entire ground floor is yours to enjoy! The large private patio leads out to the boardwalk ideal for charcoal grilling, entertaining, relaxing and people watching. 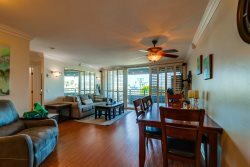 The kitchen has been updated with all modern appliances and ceiling fans are located in every room. If you don't already enjoy cooking you might after spending some time in the beautiful kitchen with granite countertops, breakfast bar stool seating and a mahogany dining table for 6. The living room furniture, sofa sleeper and large flat screen TV with DVD player, provide a very comfortable escape from the outdoor sun while still allowing you to take in the priceless view. The Maytag washer/dryer and full bathroom are between the kitchen and master bedroom. This lovely tiled bathroom is equipped with bright lighting, his and hers sinks, separate bath and shower and ceiling fan. The master king bedroom has ocean views which is very rare in the area. The view is so breath taking you may not even want to turn on the large flat screen TV. The 2nd bedroom has its own full bathroom, TV and 3 twin beds. You can't help feeling at home from the moment you arrive. Always enjoy our stay at Beach Baby. Second time we have been there that the key code does not work. Would be nice not to have to carry a key to the beach.